An organization's data is its most valuable asset. Unfortunately, that data is usually trapped inside a database with few ways to access it by a privileged handful of people. Too often reports are manually generated and their results pasted into emails; dashboards get built but rapidly become outdated and never answer the right questions. We have so many great tools for collaborating around our source code, why is data still in the dark ages? At Heroku Postgres, we believe that your data should flow like water. Only the most up-to-date data should be available any time you have a decision to make. Instead of being trapped in disparate systems, you should be able to move data smoothly between development, staging, and production. It should flow across apps, between teams, and between services. That's why we built Dataclips, a tool for sharing live query results. Think of it as pastebin for SQL, or gist for your data. Each dataclip is a sharable handle to a live query and is available in a variety of formats. You can email them, tweak them, fork them, embed them in spreadsheets. We use it for everything at Heroku; from building dashboards to prototyping APIs. We've seen customers using dataclips to track down abuse in their systems, simply monitor the progress of a new launch by tracking user sign ups, or to regularly track key business metrics (like above). A few months ago we announced the ability to fork your database, enabling you to work with your data in new ways. Now you can do the same with a dataclip. Forking creates a new dataclip with a new URL that you can then modify to your heart's content. Your original dataclip still exists and will continue to be available at its original URL. We've also added better support for updating dataclips. Now when you modify the query a dataclip runs, it will maintain its URL. Any changes you make to a dataclip will appear to those who access the clip and changes are clearly visible under the revisions area. With the growing use of dataclips, it becomes increasingly important to be able to navigate and search them the way you prefer. 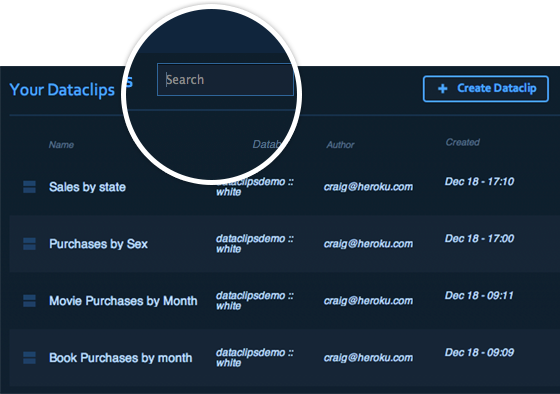 Dataclips' new dashboard allows you to easily search your clips by author, database, or name. As you create more and more Dataclips, you'll find navigating them much simpler with recent updates. With all of this important data easily sharable you may be wondering how you take advantage of your data while still keeping it secure. Dataclips have always been secured through un-guessable unique URLs, now there is the additional option to secure your dataclips to specific Heroku accounts. Now you can securely grant or remove access to data without requiring you to recreate dataclips when individuals no longer need access to the data. With the new security, when you invite a new user to a dataclip they'll receive a notice its been shared with them. If your user doesn't have a Heroku account they'll have the opportunity to create one and then access the data. Embedding dataclips directly into spreadsheets is a feature our users love -- and they do a lot of it. We do it all the time here at Heroku and routinely build simple dashboards this way. In this new release we’ve made this much more convenient. Now with the click of a button you can import your live dataclip to Google Docs and have it kept in sync. Using this functionality you can now easily build full dashboards that allow you to report against your business. Dataclips are a powerful tool to build dashboards, quickly protoype APIs, or simply explore your data. 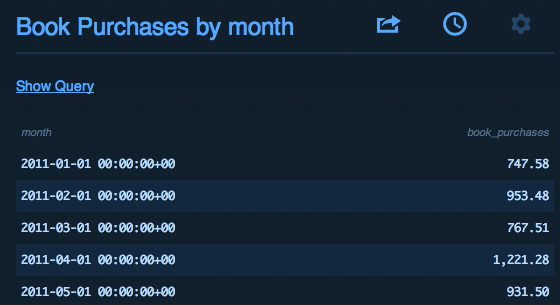 You can read more about using dataclips within our Dev Center or start using them here today.